Recently I had an e-mail from Hellen Santos, a Brazilian journalist from Globo Television, the main TV network in Brazil. She was putting together a journalistic piece on a “Brazilian feedlot that had recently installed a Bud Box and had its team trained to incorporate Bud William´s technics on livestock handling” and asked if I would send her a video clip of Bud to include. I had just sent a Stockmanship-Plus video to Denis Antonio, a MERCK employee in Brazil so I asked him about this. He was highly complementary of Globo Television and offered to send me a copy of the program when it aired. He not only sent me the link so I could view it, but he had his people translate and subtitle it in English. I think you will find it interesting. Below is the same video using another video player in case your browser can’t view the first one. A friend just forwarded this to me. . . I just wanted to write you and let you know that I used LSLH [low stress livestock handling] for an application that you may never have thought about before. On June 27th we had a lightening strike start our range land on fire. 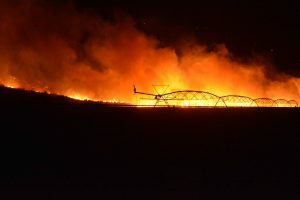 The fire was moving fast but there was a paved road between the fire and the range ground where my cattle were so everyone thought they were safe. Due to some crazy circumstances, the fire jumped the road and started roaring through where my cattle were. I have to take one step back before I finish the story. After I got back from the Republic workshop I hadn’t been crazy about how I had done, so I decided to double down my efforts. I already handle my cattle a lot but at the workshop I identified some skills I was really lacking. When I got back home I took my cattle somewhere every day and even if I just took them in a big loop, when I got them back home, I settled them. By the way, when you start getting the hang of settling cattle, it feels pretty magical! I have to admit, it still felt silly taking my cows “for a spin” but they seemed fine with it. Fast forward back to the fire jumping the road: I didn’t have time to saddle a horse, so I jumped on an ATV with my Border Collie and raced down the road to where the cows were. First off, they were all within sight range of each other because I have been working with them to stay together. I don’t mean to anthropomorphize, but they seemed glad to see me, like “Oh good, she’s here to tell us what to do.” I used the dog but I had good motion from the start, they mothered up, and went head to tail at a steady pace. That good motion drew the few outliers in and they just fell into place. They were quiet, there was no bawling, and they just moved calmly in the direction I asked them to. In fact, the flames were coming so fast that I actually had to pick them up into a jog. But even then, they just did a steady jog, no one ran. I think about it so much, it seemed so amazing! I took them two miles to an irrigated field where I placed and settled them. 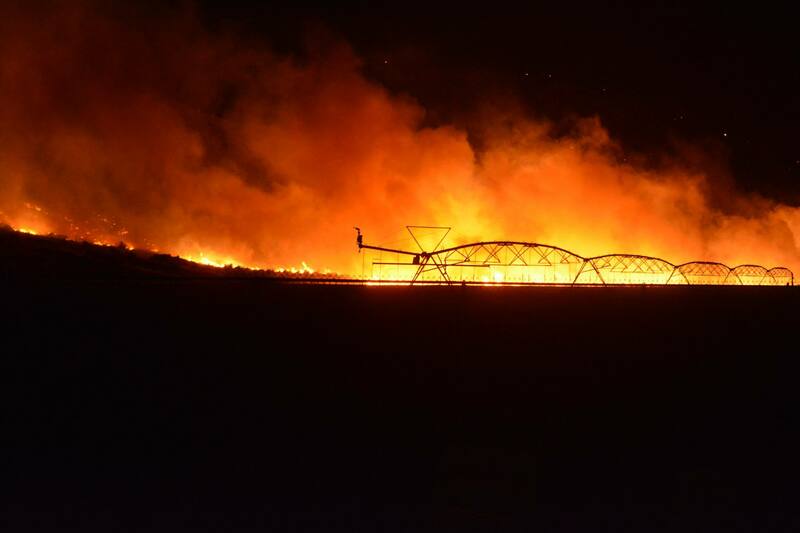 The flames roared around the field (see picture) but they calmly stayed in the field. 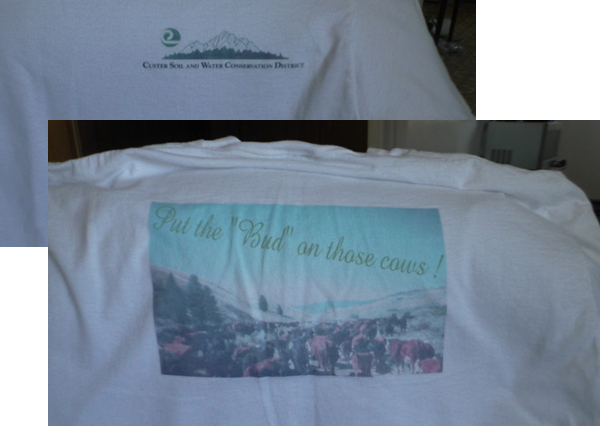 I just want you to know that I feel like you (and Bud Williams) are the reason my cows are alive today. It would have torn me up in so many ways if my cows had burned up–I can’t hardly stand thinking about it. They were in 1,000 acres, so if they had been spread out I would have lost cattle. Also, if we hadn’t practiced going places beforehand I’m certain I wouldn’t have saved them all. Thank you so much for what you do!!!!! Gosh, I just can’t thank you enough! I wrote this in answer to a post on Kit Pharo’s list, but thought it might be of interest to viewers of this site. At the risk of being the person with a hammer and looking at every problem as a nail . . .
A great many handling and health problems in livestock stems from the fact that most of our livestock are prey animals and we are predators. No matter how slow or gentle or sneaky (dart guns) we are in moving or treating our animals, they continue to be stressed by that very fact. Bud learned how to handle animals in such a way that they don’t consider us a predator. He probably put more pressure on the animals he worked than most people, since he expected crisp, energetic movement from them, but his body language and angle of pressure was such that their instinctive reaction was to go the way he wanted them to go. Bud and I spent the first years of our married life working on large mountain ranches in n/w California. It was unheard of to have a sick calf while it was on the cow. No matter how badly the cattle were gathered and handled in the corral at spring roundup, when they were turned back out the cow was able to convince her calf that she could take care of things and there wasn’t anything more to worry about. Now that most people never teach their cattle to drive and are moving them with feed, which necessitates getting the cows so psyched up that they are not in a normal state of mind, they are actually putting more stress on their calves instead of taking it off. I’m sure Bud irritated a lot of people when, addressing a specific problem, he told them to “Work with your animals and do what they tell you they need. There is no way I can write you a recipe.” Richard and Tina say “Drive your animals.” They are absolutely right, and Bud eventually got around to saying that this is the first step, during the conversation. I prefer to say “Take them for a walk” since to me, this tends to put a person in the right mental attitude to do the animals some good, and this was what Bud would tell me he was going to do when I asked him where he was going. I don’t think most livestock feel comfortable anywhere in their pastures. There are some places they feel less uncomfortable and that’s where they hang out. On the big set-stocked ranches I mentioned, certain cows could always be found in certain areas. As soon as we started working them better they stopped doing this. When Bud put cattle in the corral, unless you drove them out, they would stay there, with the gates open until thirst or hunger caused them to leave. Bud seemed to make them feel that this was the safest, most comfortable place they could be. If you are interested, go to our website www.stockmanship.com and click on the “Herding” button. Especially read “My Two Cents Worth” posted July 12, 2009 for several incidents that make me believe this is true.